IS there a way to make the mouse move? is ther a way to make the mouse move and double click continously with Auto-It? Ah, O.K. what game is it for? I got a hunch, it could be PC Hijack! $Name = @ScriptDir & "\"
@lopolop - the whole point is to NOT help script kiddies like this guy trying to write nasty programs in autoit. 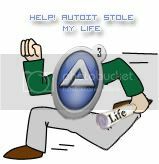 First of all, it will give autoit a bad name, and i'm sure it won't help anyone's computer either. Although I doubt this guy has the slightest idea what he's doing anyhow. @Chris LOL, yeah if they can't see the manager they can't see the process right? Although if I press Ctrl+Alt+Del and nothing opens I might suspect something is going on, lol. Sorry man, I didn't realize it was for a game, in that case try out this function I wrote. Locking thread. I really don't wish to see the level of stupidity that results from this.